Up to 100 international and Irish cycling campaigners are expected to gather in Dublin next month for the annual general meeting of the European Cyclists’ Federation (ECF). The ECF aims to “ensure that bicycle use achieves its fullest potential so as to bring about sustainable mobility and public well-being” – it represents over 70 organisations member groups across 42 countries, including Ireland’s national cycling lobby, Cyclist.ie who are hosting the AGM. Damien O Tuama, a spokesman for Cyclist.ie says one of the most important benfits of the event is that it brings together the most experienced cycling advocates from around Europe. “We are well connected digitally, but you cannot beat personal co-present human contact,” says O Tuama. He says campaign groups from countries and cities with low cycling levels – including ourselves – will gain from knowledge and encouragement from those who are campaigning for longer from countries with higher cycling levels. 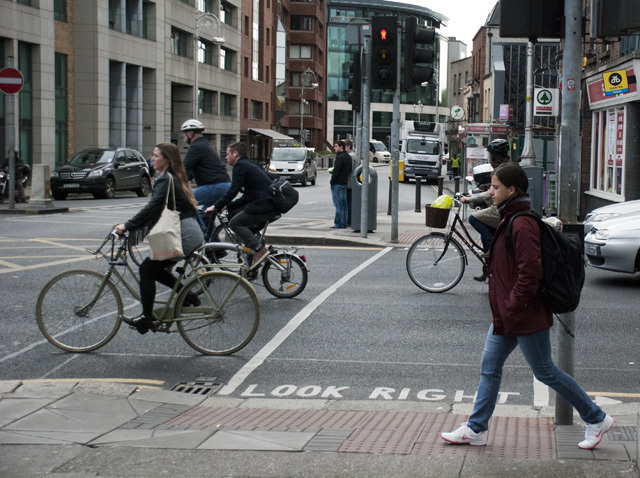 How will the estimated 80 expected international delegates view cycling in Dublin? O Tuama says their view will vary depending on where they are coming from. “Dublin sits roughly mid-range – or low to mid-range – between those Eastern European and Mediterranean countries with very low cycling rates and the Northern European countries with 20-25%+ cycling modal shares. Our experiences, policies, practices are probably more tangible to the former group of countries, than the experiences, policies, and practices of the high cycling countries would be,” says O Tuama. He suspects delegates from high-level cycling cultures will be struck by the setup of Dublin’s streets, including the absence of enforced 30km/h limits in the city, street surface design, the anti-cyclist one-way street systems, the very close mixing of buses and bikes, and the dominance of taxis on streets. He says those who visited Dublin when it hosted the Velo-city cycling conference in 2005 will likely notice the successful DublinBikes scheme which was launched in 2009. The delegates are also being offered a cycling trip to Sligo.